In the northwest edge of the Adirondack Park is a lonely road. It winds through the forest connecting a highway intersection with a small hamlet that sits beside a waterfall and a small dam. This is a place founded on the lumber industry. Now, it’s a country for hunters, trappers, snowmobilers, fisherman and retired old folks. Why the elderly would choose to retire here is a good question. It gets bloody cold in this little town and the snow is deep and seemingly eternal. The nearest decent shopping is at least thirty miles distant. But it’s the road I’m thinking about…not the village. You know a highway when you see one. But this is a true byway. Not many tourists have this road on their GPS units. It’s a byway from Point A to Point B. And it’s on this road that an old stagecoach stopover is located. There set back from the Red Tavern Road is the Red Tavern Inn. The several times that I’ve passed it, no neon signs of Bud Lite or Genesee are glowing. The hours of operation are erratic enough that you need a notebook to write them down. Then one day when I was driving around the county photographing unique tombstones, there it was and it was open! I went in and ordered a tonic with lime. I looked around. There were old photographs on the wall. The place has been in operation since 1831. This place has to be haunted, I thought. For over 180 years, travelers have stopped there for a meal and a bed. People who were on the way to the west…perhaps Buffalo…perhaps Omaha…maybe even California. Newlyweds eager to start a new life and a family. Traveling snake-oil salesmen looking to scam the farmers and woodsmen, itinerate preachers seeking a new flock to hear the Good News, fallen women looking to find a place where their past was a mystery, robbers, horse thieves, runaway teenagers, the seducers, the seduced, embezzling bankers, wounded veterans of the War of 1812, restless wanderers, the old, the young, those living in shame and those living in God’s grace. Their spirits would surely watch over the dusty rooms and shady hallways. I asked if they had rooms available. Yes, I was told, but you have to be a member. A member? Yes, it’s $25.00 a year. The rates were cheap, $40.00 for a single. I thought of the quiet. A place to write. A place to contemplate the journeys the old souls had made. Then I was told that the generator was turned off about 11:00 pm. So, there was no outside electricity. Interesting. I would have to read Proust by candle light. I thanked the tattooed bartender and turned to leave. 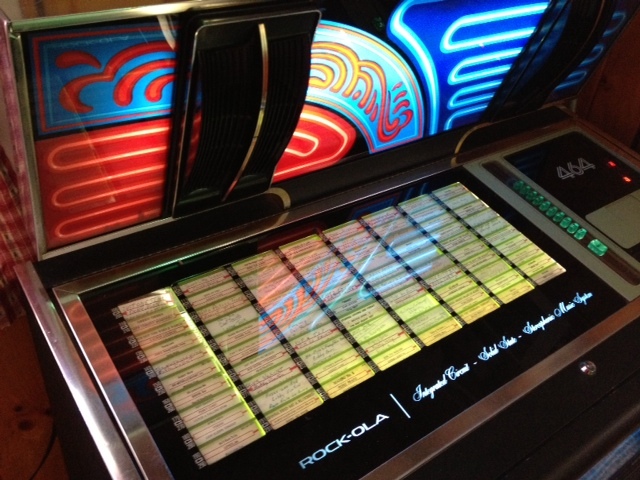 I saw the juke box on my way to the door. I stopped and looked. It wasn’t digital. It gave you two songs for a quarter. I played Are You Lonesome Tonight and The Battle of New Orleans. Through the front window, I could see a dozen bikers arrive. It was no longer my private tavern…my solitary inn. These men and women on their Harley’s were the modern-day version of the old travelers. And so was I, in a certain way. I was leaving the Red Tavern Inn for a local cemetery. I’m sure I wasn’t the first to make such a journey. I pushed the button on the camera and heard the shutter snap. 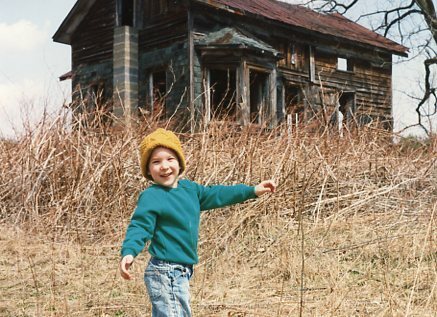 I captured my son midway through his pirouette in the field, in the field in front of the old farmhouse. Something caught my eye just as the mirror flipped up in the camera. Something in the farmhouse. I lowered the Pentax slowly from my head, keeping my eyes on the house. Whatever it was…well, it was probably nothing. My son turned toward the high shrubs, toward the house. “But, Dad, nobody lives there!” he said with honesty, and he was right. We walked away. After two steps, I stopped and turned to the house. Brian was already intent on messing up a milkweed pod. I looked at the house. We called it “John Tumbledown’s House” when we spoke about it. It was just at the edge of the property line of my father’s thirty acre wood lot. The place had been abandoned for quite a few years. There was some story about the old place, but no one I talked to could provide any details. Something about the man we had begun calling John Tumbledown. Something about how and when and where he died. We found a berry patch alongside the wood lot, at the edge of an old field. Was this John Tumbledown’s cornfield? I sat and stared at the old wooden frame, the weathered wood, the sun-burned roof, the bleached siding, the broken steps and the pane less windows frames. A bird flew out of an upstairs window. A shutter banged against the outside wall when a slight breeze passed. The season was early Autumn. The trees were leafless. The high clouds made the sky milky. The air was cool…perhaps chilly. I thought about fear. I thought about why the house made me uncomfortable. I thought about why the house didn’t seem to have any effect on Brian. You hear stories that children (and dogs and cats for that matter) often exhibit a sixth sense sometimes. Young people have less clutter, less static in their brains than we adults. A child sees and hears things we don’t. But that wasn’t happening here. Brian felt totally at ease. I, on the other hand, felt odd and off-balance. Disturbed. Worried. Wary. Protective. Something about the house…something about John Tumbledown. The shadows grew longer. The air turned colder. It was time to leave. Only when I had the film developed did I notice something. Was this what caught my eye when I snapped the picture? There, on the first floor…there is something standing there…in the doorway. You won’t find it in the guidebooks. You probably won’t find it at all without sitting in a dusty room of a Historical Society and doing your homework. Not many people know it exists. I found it because I had a decades-old topographic map in my possession. And still, I found it by accident. The symbol for cemetery was on the map. But, even with that on my knee, it took me a long time to locate it. You won’t find a more lonely grave than this one. Well, maybe you could find something similar. Take for instance the grave of Kitty Gray in Dartmoor. I’ve written about her. She’s buried at a crossroads because she was a suicide. Not many places get lonelier…out there in the mists of the moors…but at least she rests at a cross-roads. There are people who hike and drive by her grave everyday. 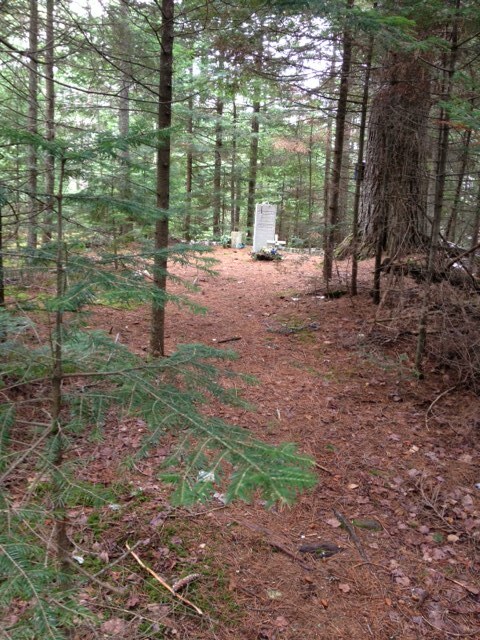 Not so with this particular gravesite, in the Adirondack forest where the trees have taken over what was once a hardscrabble farm. The farmhouse is long gone. No crops grow. But a tragedy occurred in the old farmhouse, well over a century ago. The details are sketchy. The facts are hard to uncover. But there is a name and dates on a lonely tombstone. The birth and death dates tell you clearly that the person who rests here among the trees, the singing birds, the wind, snow, rain and ice…was a boy of eighteen months of age. He has rested at this spot for 167 years. The tiny clearing had the lingering aura of a holy place…a shrine. People wrote about sick grandparents, pets that have died and asking for help with their own afflictions. As I’ve said, the details are scant. I don’t even recall how I learned the few facts. There is a little box nailed to a tree just a few feet from the stone. It could pass as a bird house. But it has a door and if you open it, you will find a nylon pouch. Inside the bag is a logbook. People have signed the book and told how they knew about the existence of the grave. Some entries read like it was a book of prayers and pleas to the little boy buried there. The story, as I know it, is brief. The boy was being given a bath in a tub in the kitchen of the farmhouse. An accident with the boiling water…a boy was scalded. He died. He was buried in the field. The family went west, disappearing into the heartland and from the pages of local history. Maybe there’s more to the story. If so, I haven’t been able to trace it. The field is now second-growth forest. The grave is hidden by the trees. The boy is shrouded by the moss, lichen, leaves, pine needles and trees. The moonlight may shed a dim glow on his stone. The eternal stars may sparkle through the gaps in the treetops. I stood over the tiny plot in the late afternoon. The shadows were lengthening. If I remained there, I would not fear the dark. Rather I would find comfort in the solitude. I thought of the Tomb of the Unknown Soldier at Arlington National Cemetery. There are honor guards present to keep watch every minute of every day of every year. This is the Tomb of the Unknown Farm Boy. But he has no human to watch over him, only the trees, older than any Honor Guard of Arlington…unmarching…but still protective. There is a name on the stone, but I think of him as a surrogate for all the unattended dead. I do not or cannot believe that this grave (or others like it) are truly forgotten and deserted as it may seem. Someone somewhere harbors a memory, a family legend, a family history, a diary, a clipping of who this child really was and how he came to rest in this particular spot of the Northern Forest. And, even if no familial memory exists, a silent clearing amidst the trees and the little stone, tells its own story. I spent thirty-five (+/-) years standing front of a roomful of students. Doing the head math, it probably means I pushed chalk and rambled on about all kinds of things (sometimes, I even talked about science) thousands of times. Of course, being shy and bashful by nature and carrying vast amounts of insecurities and inadequacies, it wasn’t easy. I just made it look that way. I had confidence. 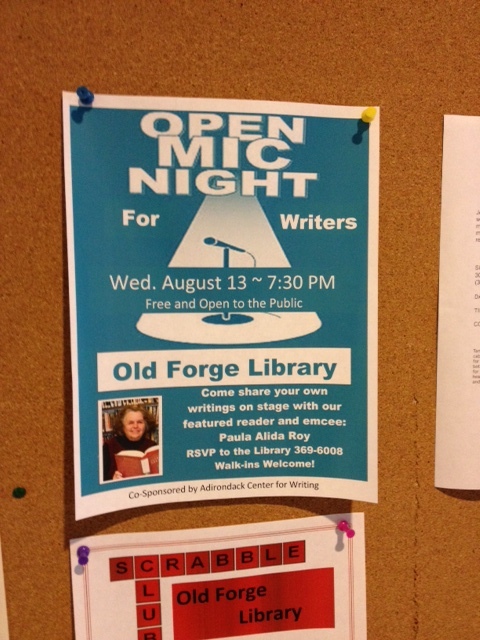 But on August 13, as I was waiting my turn to read something from one of my books at the Old Forge Public Library, I felt my anxiety level rise. There were twenty of us scheduled to read. I looked around. Hey, I wrote four books, I’m as good as any of you. But, was I? Self-doubt crept into my heart. 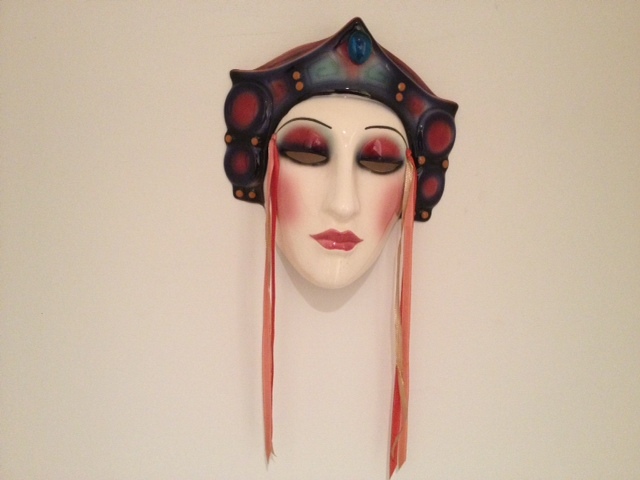 My inner critic began the usual taunting: “Who do you think you are? 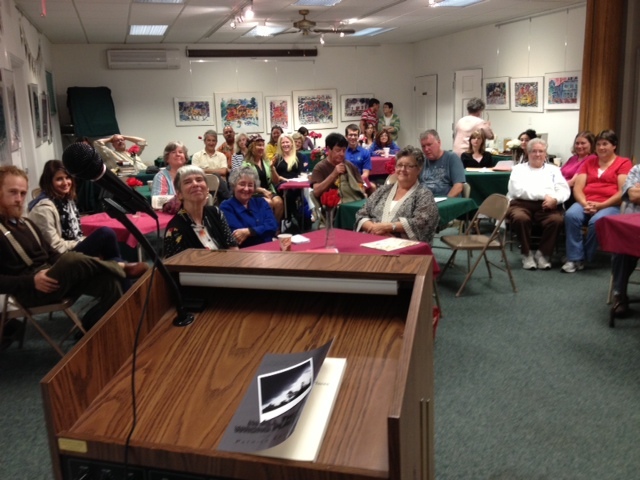 These people are real poets and writers, you’re just a retired old science teacher. And you SELF PUBLISH , not like a “real” writer. “Please, for those who are going to read tonight, I ask that you keep your time to less than five minutes,” said the emcee, a poetry teacher, (who made sure all her students from a recent workshop went first). I picked up my book. I brought “In All The Wrong Places” with me because some of the stories are set in the Adirondacks. I flipped through the one I had chosen. Five minutes? No, this one is too long. I flipped back and forth looking for a shorter piece. I found one. It fit. It was set in the locale. My throat tightened. Where was my experience…my years of talking to classes, large and small? Where was my speaking muse? I removed my glasses and set them beside the microphone. I can’t read with them. I can’t read well without them. I squinted my way through the 3+ minutes. The roar of the crowd was really a polite clapping. I bought two slices of pizza on my way back to the hotel. I sat on the bed and went over the evening again. No one asked for a copy of the book. No one asked for my autograph. No one paid the slightest bit of attention to me. I decided that something was missing from my “act.” I needed something more…eye-catching…memorable. That was when I made a personal commitment to learn how to do the “moon-walk” like Michael Jackson. On a Tuesday Betty sat in the passenger’s seat of her car in our driveway. Her husband, Bob, was behind the wheel. They took our Netflix DVD (we share an account) and drove home. On Wednesday, she became unresponsive at her kitchen table. She suffered a stroke. On Friday, she was in the ICU for a short time. Nothing could be done. She went back to her room. On Sunday afternoon she rubbed Bob’s hand several times and then passed away. She was 86. We were friends with Bob and Betty for 15 years. We had come to the Adirondacks in 1999, not to camp, but to enjoy a cottage by a lake. The cottage, The Gazebo, belonged to Bob and Betty. It was at the end of that week that Mariam announced that we were going to buy a house…on a lake. We did. They remained friends since. I read her obituary today in the local newspaper. It said that she married her life-long sweetheart of 83 years. Wait a minute. That must be a misprint. She passed away at 86 and her “lifelong sweetheart” went back 83 years? Mistake, I said to myself. Bad editing. Bad fact-checking. But this was no cliché. It was true. Bob was a little boy when Betty’s mother gave birth to a girl, 86 years ago…at home. Bob stood across the room and watched as this girl was delivered. They named her Elizabeth. They grew up together. They married. They’ve known each other all her life. How many people can say that…and mean every word? My heart breaks for Bob. How often does it happen that one buries a wife 86 years after seeing her come into the world. The pain must have been crushing. What else can make someone do whatever Robin Williams did Monday morning in California? Let’s consider clowns. The face of Comedy and Tragedy are on the same coin. It flips in the air and lands with a smile or a frown. With Robin Williams, it landed differently at different times. This time the frown looked him in the eye. Remember Emmit Kelly? The saddest face on a clown I ever saw. He made you laugh even though his act was pure pathos. Red Skelton? Same. Many clowns laugh on the outside and are crying on the inside. It’s a cliche. I’m no clown, but I’ve had a peek into the abyss twice in my life. It’s scary as hell. There may be 2500 $70 ticket holders filling the theater, but when the show is over and you think it will never get better…it will scare the hell out of you. I’ve seen Robin perform twice on stage in NYC in the last fifteen years. He was inventive, vulgar, brilliant and always…always so funny that you had to force yourself to stop laughing so you wouldn’t miss the next line. I would never miss his appearances on David Letterman’s show. I’m alone tonight with my sadness. 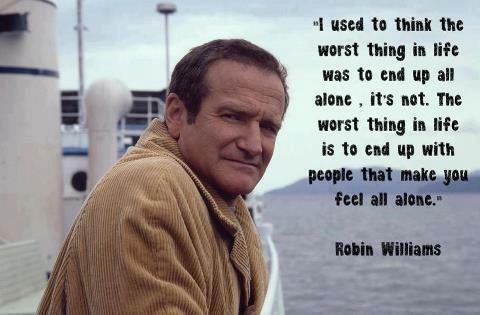 I will miss you, Robin. You never met me…didn’t even know I existed…but I was your friend. Her eyes do not see my face, my grey beard, my grey hair or my imperfect eyesight. No, but she can see my very soul. She can speak to me without moving her porcelain lips. I feel that she can see my past and my future. Will she tell me why my heart breaks for something I did 49 years ago? Something was said to hurt someone’s precious feelings. I did not say the words but I heard them…and I did nothing. That makes me guilty. Can she tell me why I miss certain people I have known? People who are no longer near me…brothers and parents who have parted. Lovers and friends who have turned away from me…leaving me on street corners in the rain…in phone booths with a handful of quarters…empty beds…expensive hotels…cheap motels. Will she tell me about the rest of my life? Will I always be lonely? Will I always regret the things I did not do, instead of the things I did? How long is a lifespan? Will I pass with grace and dignity, or just staring mutely at the wall, with a chemical dripping into my forearm? She doesn’t even see into my eyes. She is desirable without desire. Cold, aloof and passionless. She can tell me everything but she says nothing. She’s the Fortune Teller on the Wall.